There are currently 2 users and 1057 guests online. you are living the dream ! Heading out on Wednesday our time with some clients. The Whaoo are massive at the moment. a 46kg was landed today with the avarege size at the moment around the 20kg mark. After reading the tails of fishos hooking up to very good pelagics only to get them close to the boat and have the grey ghosts take them I'm interested to know if you have that problem in your neck of the woods. Yes as with everywhere alse in the world we also have problems with sharks in certin areas around the island. They seem to hang around the edges so once you are 1 km off shore they dont seem to bother you. The only problem with the wahoo here is they like to hang around the back of the breakers right where the sharks are. 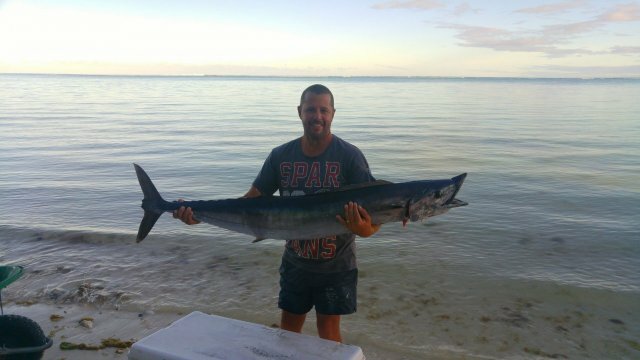 Thats a beauty of a wahoo mate! Well done mate.